A live recording from the Thomastik Infeld - Haus der Kultur (Cultural House), A - 7131 Halbturn. This CD was not planned, it simply happened! As the recording was so good, we made a CD of it. 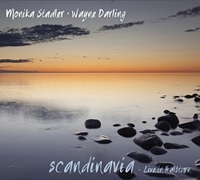 It contains original compositions by Monika Stadler and Wayne Darling, as well as Louiz Bonfà's jazz standard Black Orfeus and a beautiful Swedish folk song. A CD full of the fresh, dynamic, utter joy of playing music, combined with masterful talent and deeply touching musicality.